Gardens need destinations. And if that destination is slowly revealed even better. 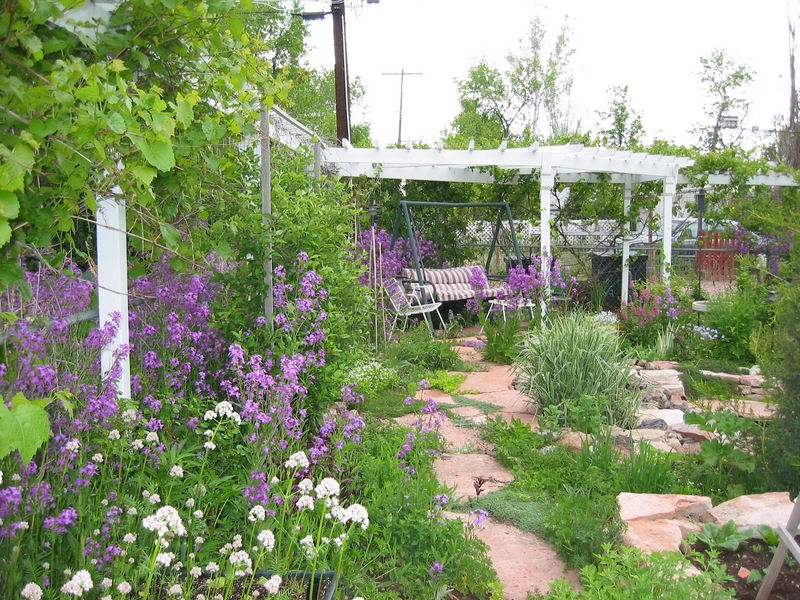 An arbor not only is beautiful but it can fill a need. In this case give shade and shelter and a place to rest. And, less you think it is all work and no play for Ted, I have found him asleep on the comfy cushion swing bench., that sits under this arbor. When you first enter the garden you cannot see this arbor. You have to walk down the path and turn to the right behind the Little Pink and Yellow Garden House. At this point there are hops growing on the arbor. They rise from the 2 front post. 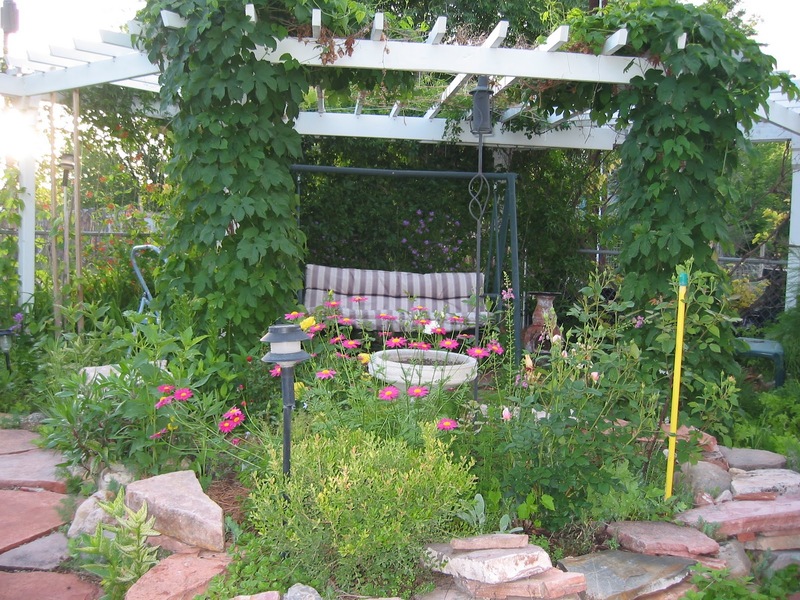 The arbor sits on the north west corner of the garden. The problem was that hops want to follow the sun as they grow. So every few mornings I would be out turning them back to the north onto the arbor. And, hops leaves have little hairs on them that are irritating to some persons. I found them to be very irritating. So a couple of years ago, I dug them out. What a workout! BressinghamThyme carpets the area around the arbor. I love this low growing thyme. I removed the hops and have let grapes grow over the arbor. Well, we have this in common too, Gloria. I dug out my hops several years ago after they kept escaping into the neighbor's yard. Later, said neighbor informed me that she really liked them. Oh. I suppose the lesson for both of us is that universal gardeners' credo: "right plant, right place." I love your garden photos. Spring can't come soon enough. What a happy spot, Gloria. Makes me long for a warm sunny day, a good book, and nary a computer in sight. I love the thyme growing where you can walk on it and release its fragrance. Gloria, another lovely area of your garden. At my last house I had a thyme "lawn" in the middle of the back garden. My dogs found it their favourite spot to lie and soak up the sun! It certainly made them smell better, lol. It is a wonderful destination. I think your 'floors' are the best garden floors I've ever seen. Gloria those grapes are amazing! Just wait till I show my DH those! You sure do like your arbours - another beautiful one this time to sit under rather than to walk through. I am so glad I have found out that someone else comes out in a rash when they come near humulus lupus aureus. I have 4 of them and it was only last Autumn I figured out it was them that attacked me. The rash down my arms was awful. I still like the foliage effect so for now the 3 thugs are staying lol and I am thinking of getting rid of the 4th one but its roots are growing beside my bamboo and I don't think I have a hope of getting a spade into that ground. Yeah! I have been looking forward to the unveiling of your next arbor. It is beautiful. I like destinations in a garden, especially ones that you cannot see until you turn a corner. On another note, I enjoy visiting your blog in the middle of winter because you post such beautiful photos of your garden in summer. Yes, Carol I do make wine. We get about 100 pounds of grapes. Yikes! It's either pick them or the birds will poop purple all around! I give most of them away. Some to my wine making friends, some to my jam making friends. Gloria, your gardens are just so inviting, relaxing, beautiful, you name it. I would love to come and sit under one of many of your arbors and stretch my legs out. Amazing. Gloria, your arbour is beautiful, especially with those wonderful grapes growing over it. What a wonderful spot to share a cup of tea or just while away the hours. How pretty! I love everything from the top of the arbor down to the flagstone planted with thyme! 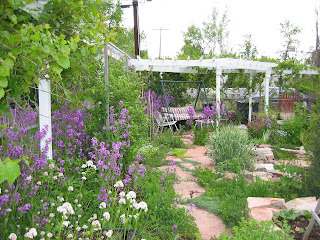 Dear Gloria, I was immediately drawn to your comment that gardens need a destination - exactly one of the points I made this morning when writing my own blog. Arbours offer such wonderful opportunities for rest and contemplation. That is if we gardeners ever really have the chance to put our feet up. Having found you on Blotanical, I shall look forward to following your progress. Dear Gloria, I have just noticed that you have become my latest follower. Thank you so much. I am thrilled. I forgot to say in my earlier comment about your posting on growing lemons, a topic I explored the other day. In comparison, I bow out now. I've been threatening to make homemade wine for years. You'll have to share your recipe! I agree gardens need a destination and I'd love to have a cozy corner just like yours. Grapes! How wonderful! You are my hero. I have a gazebo covered by grape plants, but the place is shady and there is no much fruit.